Marriage gives great excuses to travel the world and eat different foods. We call these anniversary trips. I took the Wifey to the nice cozy town of Branson. While being apart from my Panclog partner, I wanted to try out some country pancakes. I received Stephen’s blessing to review and spread the good news of Panclog. My first stop was at Billy Gail’s Cafe. 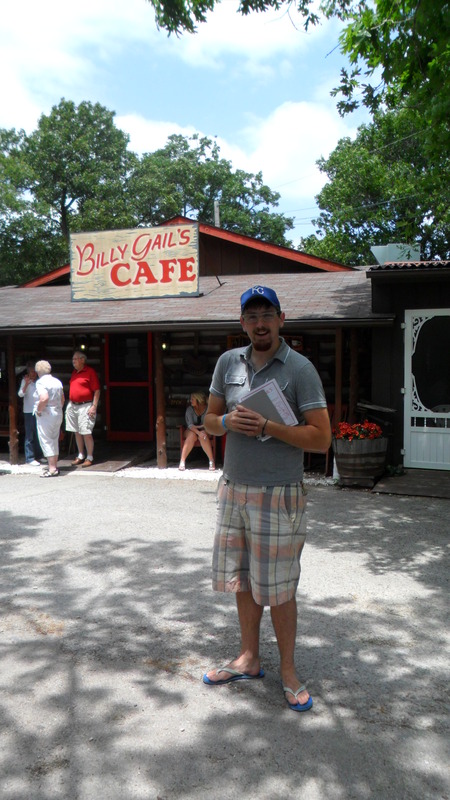 Billy Gail’s Cafe is a legendary eatery in Branson, Missouri. You can find it at 5291 Missouri 265, Branson, MO. They are open 7 AM to 2 PM daily. This love-shack of a restaurant is located on the side of a busy highway. Billy Gail’s does not have a website themselves, but you can find them on any trip planner website ever! Foursquare led me to this country food junction. All I did was search for Pancakes and Billy Gail’s Cafe was the first to pop up. I only saw one comment… “The pancakes are bigger than the plate!” I was in! Location/Environment: I decided to celebrate Memorial Day and my Anniversary the best way you can. With Pancakes! The first thing you notice about Billy Gail’s is their complete lack of a parking lot. It was gravel parking. I understand how this could add to the feel of Billy Gail’s being a country kitchen but it backfired and just felt unorganized. Billy Gail’s was incredibly busy, it being Memorial Day and all. We had to park across the street. We were told by the owner, Gail, that the wait would be “a good 30 minutes.” She also pointed us toward the free coffee while we waited. The Cafe was located on the same lot as a cute local hand-made shop. The cafe also had newspapers and games to use as the perfect time-waster. A good thing about Billy Gail’s is that their customer base seem to be very patient and not complainers. This makes waiting so much easier. Service: The staff seemed to be overwhelmed with how busy the were. I experienced a lack f refills coming my way. That may have been a technique they use to increase table turnover. One bright spot of the meal was the fact that the owner, Gail, walked around the whole restaurant asking how everything was. This struck me how as something that more restaurants should do. Menu/Selection: Billy Gail’s Cafe had all the usual suspects that accompanies a brunch spot. They have something called Billy’s Belly Buster Breakfast. This includes 3 eggs, 2 pancakes, a meat, hash browns and toast. Even their lunch was pretty extensive. Lunch includes burgers, soups, salads, hot and cold sandwiches. So if you are a non breakfast eater in a sea of brunch enthusiasts like the Panclogies, you will be pleased. 14″. These pancakes are very large. 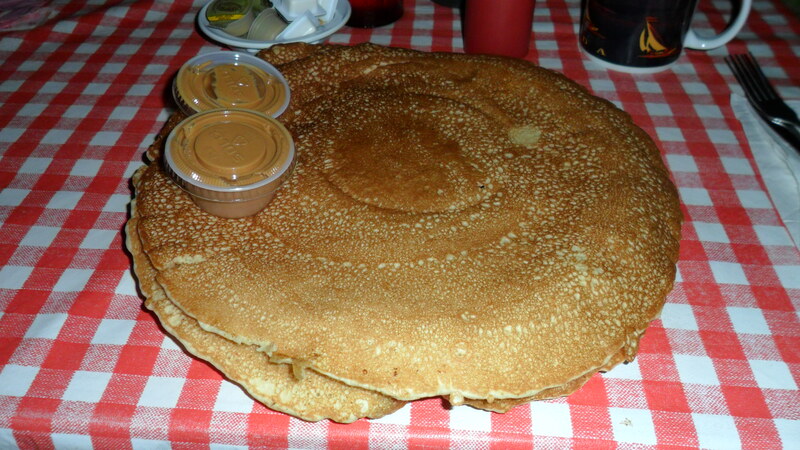 At many restaurants they try to warn you about the size of their pancakes. In all my pancake life, this is the only place that should be allowed to warn you. These pancakes were honestly bigger than the plate. These were 2 ginormous buttermilk pancakes. They were served with 2 travel cups of creamy peanut butter. Some restaurants put peanut butter chips into the batter. Everyone knows I am a fan of the toppings actually in the batter. But I think I enjoyed the peanut butter spread. There was no dollop of butter. The butter or margarine was in single serving packages. The syrup was in a squeeze bottle. It was room-temperature. The pancakes were still warm so when I spread the peanut butter it melted and was soaked into the pancakes. These pancakes were an adventure to eat. I decided to tear off the sides and put them in the middle. These pancakes were very thick due to the good amount of peanut butter on them. I finished them as if that was in question. These pancakes were $6.50. This is cheaper than other places. Especially with size of pancakes. I enjoyed going on the quest to try these size-able pancakes. I would have preferred my butter on the pancakes. Price: In Billy Gail’s Cafe, there was a feeling that all of the knick knacks that decorated the cafe were for sale. This was true. So if you do not find yourself buying everything, you will be left with a manageable ticket. You will not feel like you are being robbed. You must remember that Billy Gail’s does not accept credit cards. They accept cash and checks. Overall: Billy Gail’s cafe was a good adventure. The wait was almost unbearable. It took forever. But if you are in the area in the early afternoon (was incredibly less busy when we left). I advise you to stop and have a go at these large pancakes. You can follow Jared on Twitter.